I frequently get questions about how I actually recreate these backgrounds. Today I was working on refining a B/G for one of my Mary Poppins Penguin cels, and I thought I'd show the process, step by step. There were actually eleven layers. Here I am sharing the major steps only. On rare occasions, a background will appear for a frame or two by itself, before a character enters or leaves a scene. They are the exception, however. Usually the animated character(s) move all over the scene. So then, the concept is (with DVD screen caps) to look for the places where the character is NOT. I layer these in Photoshop like a jigsaw puzzle, blending the seams where the pieces meet, and eventually I have a completed background. As an example, here is a montage of just a few of the background fragments this POPPINS piece required. I darkened the underlying original frame cap, so the background pieces really stand out. This shows exactly how the process works. You can clearly see in each successive frame a different piece of the background, with which I can cover the penguins, thus re-creating the entire original background. It's a painstaking process. This one took about five hours. I was lucky here, the colors matched perfectly frame to frame. The really tough ones are long pans where the various sections' colors actually change hue, brightness and/or tint. All this can be adjusted, but it compounds the complexity of the process exponentially. Since this POPPINS setup has people in it, there was one more step than usual: they had to be digitally erased on each layer so their original key frame position remained. Remember, you can always click on the images to see a larger version. Here's the finished background. 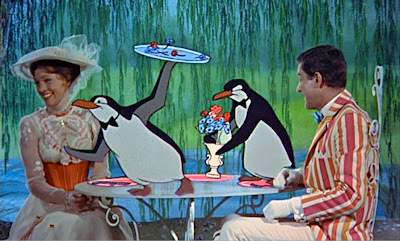 Notice there is a slight artifact of the left penguin's flipper on Mary's dress. This is good - it will help with exact placement of the cel overlay. It will disappear underneath the cel, as will all the re-created B/G art. But at least we got to see it, first! And just for fun, I took an earlier view of Mary turned toward Bert, and overlaid that, so you could see a finished image of Bert and Mary at tea, with the table set, no penguins, no flipper artifacts, and a beautiful unobstructed view of the background art. "Ain't it a beautiful day?" That sounds really intense. It looks super cool though!! Thanks for taking the time to explain this to all of us! Even this level of detail is fascinating to a layman like myself. Rotoscoping is a process invented by Max Fleischer where people are filmed and the film is traced to create (theoretically) life like animation. It looked slightly weird. Disney animators found it was better to use live action film as reference. Anyway, rotoscoping has no relationship to the process of recreating animation backgrounds. Wow, 5 hours? I've made some from Chihiro, and they took me less than 15 minutes each. Wish I could figure out a fast way. Each piece has its own time frame. Wasn't it Disney who invented the process of layering animations? I can see how this hobby to get to the backgrounds would be all-engrossing! What a fabulous mind you must have! But isn't fun that we have the technology to study these things? You could be teaching an art appreciation course - for Disney! virtual voyage:So informative things are provided here,I really happy to read this post,I was just imagine about it and you provided me the correct information. Don't miss "ART CORNER RESTORATIONS!" Have you been to Baia?